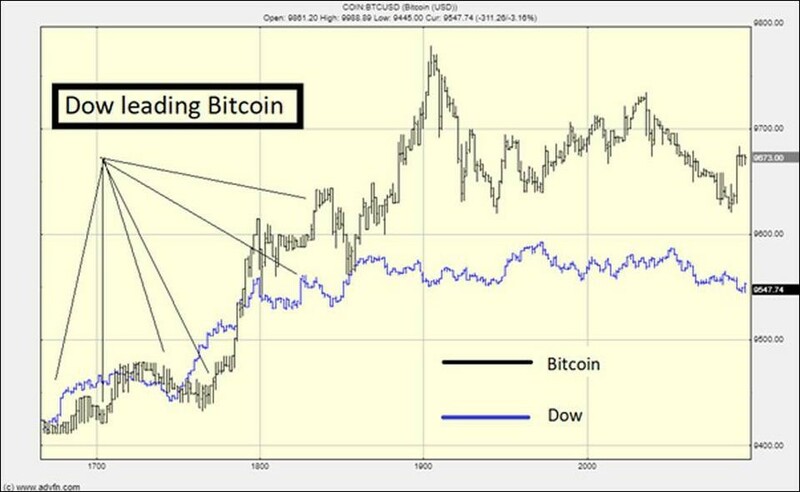 Is There A Correlation Between Bitcoin And Stocks? Does Bitcoin go up or down when stocks climb and vice-versa? The subject of how bitcoin prices are affected by stock movements has fascinated traders since the digital coin gained media attention a couple of years ago. A bitcoin/stocks indicator would be ideal for traders looking to predict the direction of one market or the other. In the early days of bitcoin, daily traded volumes and the overall market were too small compared to the then-$15-trillion stock market. As expected, the correlation between the pair was too weak to be of any significance. But then bitcoin finally exploded in 2016/2017, with the market cap growing nearly 45 times bigger. Yet, bitcoin's relationship with stocks has remained very volatile and inconclusive. It hit an all-time low of -0.15 in November 2017 before climbing to zero in early 2018 then shooting to 0.3 in February. In February, the correlation between bitcoin and stocks remained high with daily percent returns of the leading cryptocurrency and the S&P 500 clocking in at a respectable 33 percent on a 90-day basis. A correlation score of 1 indicates perfect correlation, zero indicates no correlation while -1 is perfect inverse correlation. The long-run average on a 90-day correlation for the pair has been -1 percent--a very weak negative correlation. The correlation between bitcoin and gold has also been erratic just like that between bitcoin and stocks. The one-year rolling correlation between gold and bitcoin returns was mostly positive up until 2015 when it turned negative with a reading of 0.14 during the positive period and -0.2 during the down-leg. There's a widely held view that rate hikes are a natural enemy for gold prices, with many investors mistakenly believing that higher interest rates mean lower gold prices and vice-versa. 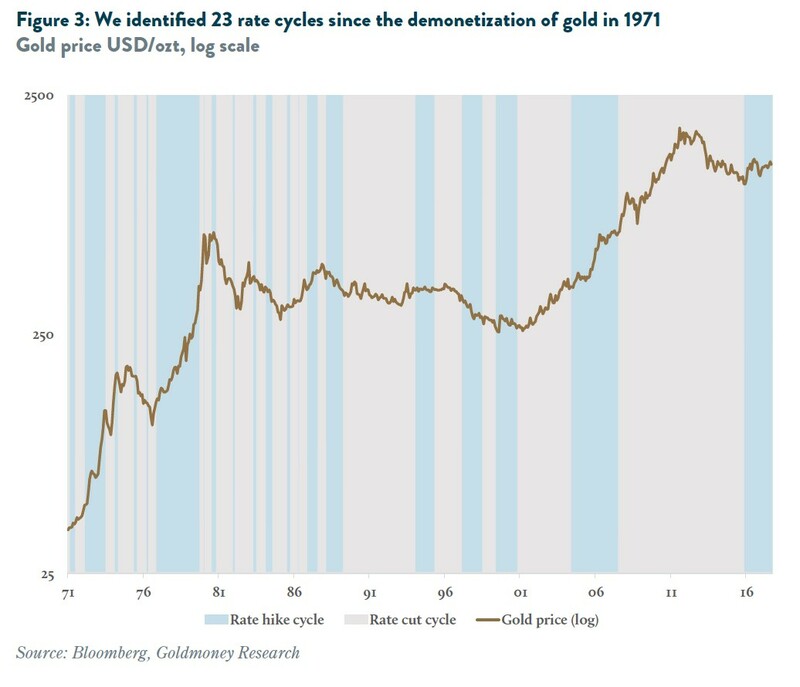 Yet, the correlation between gold prices and nominal interest rates from 1970-2016 reveals that gold performs equally well during rate-hiking cycles and rate-cutting cycles, with the former lasting 10 months, while the latter lasts 14 months on average. 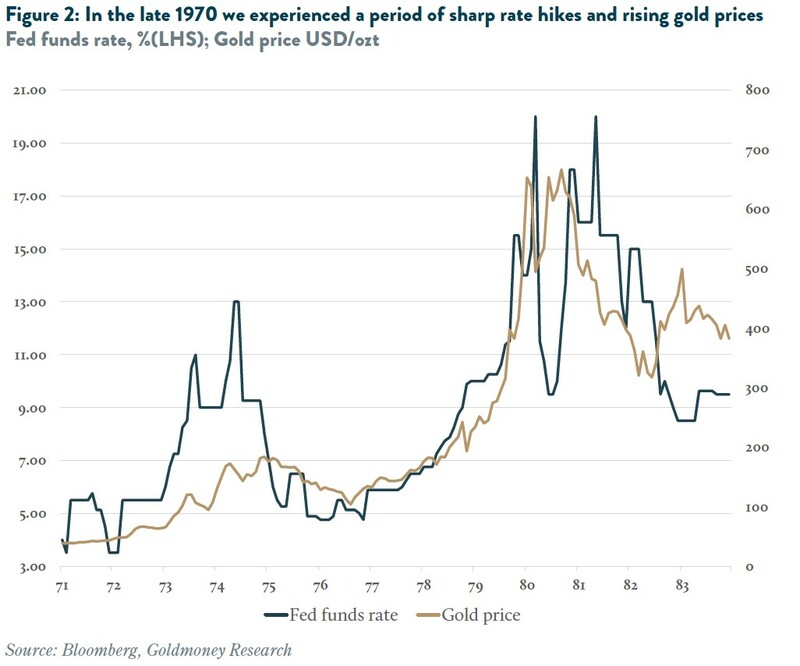 In fact, gold prices were moving sharply higher in the late 1970s and early 1980s at a time of sharp interest rate hikes by the Fed. Curiously, gold did better during periods of rate hikes than rate cuts by climbing 4.85 percent in hiking-cycles compared to 4.0 percent during cutting-cycles. That's the case because interest rates are just one of several key drivers of gold prices, the others being inflation and changes in central bank holdings. The same reasoning can be applied to the relationship between bitcoin and stocks. Both assets sometimes do show near-perfect correlation. For example, this author has a hypothesis that bitcoin and the Dow Jones are positively correlated. 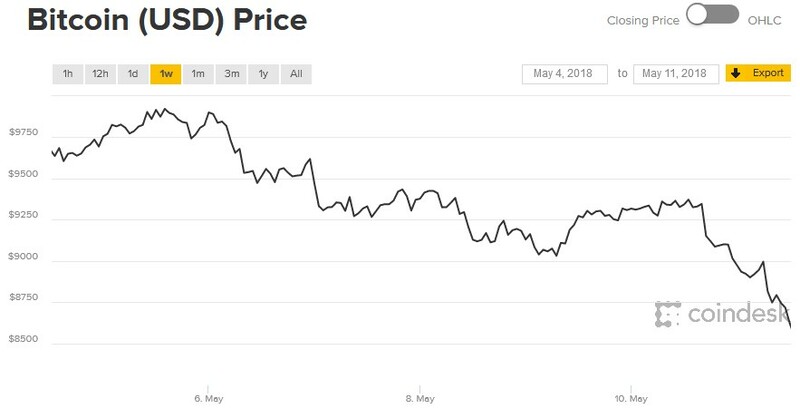 According to the author, the two climbed in near-lockstep on May 4 because institutional traders were using both bitcoin and stocks in carry trades i.e. using cheap money from the Fed to purchase higher-yielding bitcoin and stocks. The author argues that The Dow Jones can be used as a leading indicator for bitcoin in times when excessive liquidity is injected into the markets. That's the case because there other factors at play in the bitcoin market including activity by futures traders, insiders and Bitcoin whales. The verdict: the correlation between Bitcoin and stocks is far from being clear-cut. It might take years or even decades before a relationship is established.